I’m very sorry for being late today because they miscalculated the time that it will take to reach this place. We are talking about truth. Truth that we know of cannot be conceptualised, cannot be mentally understood. We have to know that truth is beyond mental conception. If we believe that this piece is hot, or this piece is cold, (pointing to the microphone) it’s just our mental idea. But we have to feel it, experience it. The truth has to be known on your central nervous system. It should not be just a conception that; “I’m very happy. I’m very joyous. I’m very blissful. I have found the truth.”, because truth can only be found out through our evolutionary process. We cannot achieve it through our human awareness. Human awareness is limited and whatever we do through our human awareness is also limited. If we have to ascend higher, we have to have a higher awareness, a superior awareness. This has been described thousands of years back in India and all over the world. Many great incarnations, prophets, all over the world have been talking about this awareness; this new awareness that we call self-realisation. In the name of these prophets and incarnations many religions were formed, organised, but I think they all missed the point. They missed the point that you have to be something higher; you have to be self-realised; you are to be born again. It’s the actualisation of the experience that must be asked for. On the contrary, artificially we have certified ourselves as realised souls. Supposing I certify myself as the governor of this place, do I become that? If I proclaim something, then I must have the powers of that particular position. When people say that they are realised souls, they are chosen people, they are special, people of God; we find they’re just like everybody else. They talk big about God, religion, everything, they can talk about everything! It’s only talk, talk and talk, all imagination. There is a story about the punishment of Shah Abesh. This fellow was a cheat and he went and told the king that “I’ll build you a very big palace; you have to give me some land.” And after two years he came back; he had taken a lot of money from the king; and said “I’ve built a very big palace for you.” So the king went to that place and found nothing. He could not believe his eyes; “What is this?” But Shah Abesh said: “No, just see, there is a house. You can see; this is the place you arrive; now this is the big palace and this is the courtroom, and this is the big throne for you to sit down.” So the king closed his eyes, tried to feel everything. He opened his eyes to see anything. Nothing, he could not see anything but open land. He was quite amazed. So he thought of a punishment. He asked Shah Abesh: “All right, it is very great. Now this is the throne. You’d better go and sit on the throne.” So Shah Abesh went and took the pose as if he was sitting. So he said: “All right, go on sitting like this!” and his legs started paining and he admitted that; “Yes it was wrong. I’m sorry I told you all lies.” Now this story tells you how we have been all misled into a very wrong land, that we are amazed and shocked, that how these people are following God or some demons? So now, one has to know that there must be something that is absolute; to find out the truth. We live in the relative world. We do not know what is right, what is wrong. We should not have gone to extremes into anything, and followed something blindly or through our ego. The time has today come for us to become the Spirit. This is the special time. We are born in this great blossom time, when all of us have to become the fruit. But it is a living process. How did we become human beings? We became without doing any work, without paying for it, like a seed becomes the flower. How much do we pay to the mother earth for sprouting a seed? She doesn’t understand money. Money is the human headache, not of the nature. So in the process of this natural ascent today one has to become the Spirit. Now when I’m talking to you about the mechanism that is built within us for our last breakthrough, you need not believe me. In our country also, this knowledge was kept a secret for thousands of years. Though we can say people like Markandaya, whose dates could be 14,000, or later on up to Adi Shankaracharya; people did write about the Kundalini. And at the time of Adi Shankaracharya, he very clearly talked about it. That was the tradition of evolution described in all these great scriptures. Even in the Bible you find the tree of fire. It says: “I will appear before you as tongues of flames.” Even Mohammed Saab, who came much later, very clearly, very, very clearly and elaborately, at length talked about the resurrection day. He said: “At the time of resurrection your hands will speak.” But everybody missed the point. Zoroaster talked about it thousands of years back. Confucius, Lao-Tze; everyone talked about it; that we have to be the spirit. Christ clearly said: “You are to be born again.“ Then Nicodemus asked him: “Do you mean to say, I should enter into the womb of my mother?” ”No,” he said, “whatever is born of the flesh is the flesh. You are to be born of the Holy Ghost.” But they don’t know what the Holy Ghost is. If you ask them, “What is the Holy Ghost?” they say, “We are agnostic. That is a mystery.” If that is the mystery, what are you doing there? They say: “We’re doing our jobs.” Under these buildings of Shah Abesh you don’t know what to do with all the religions. These artificial concepts have misled us quite a lot because we have gone into extremes. Now logically we should also understand that if there is the God who is the father and the God that is the son, there has to be some mother somewhere. I’ve not heard of any father producing a son so far. So who is this mother? She is the primordial mother. In Greece, Athens… you know ‘Atha’ in the Sanskrit language means primordial. (Translator doesn’t understand.) Atha, Athens, Athena; Athena is the primordial, Atha. And if you see her statue, they have shown a snake-like thing on her hand with all the centres, just like a Kundalini. In the triangular bone this Holy Ghost resides within us. This is the mother who is going to give you your rebirth. In Latin it is called the ‘sacrum bone’. That means they knew it was a sacred bone. I don’t know…, the whole knowledge was lost there perhaps, that nobody continued with it. In India, later on, it became very, very open to the public when, I would say, Adi Shankaracharya talked about it; and Guru Nanaka and Kabira very clearly talked about Kundalini. Gyaneshwara also very clearly talked about it in Maharasthra. This power resides within every one of us. If this power could be awakened then we can get our self-realisation. No one has described that when this Kundalini awakens you get all kinds of complications. But about a hundred years back in India, some people became aware that there is a market of lots of seekers coming up. And they wrote some books which have no relevance whatsoever to the traditional knowledge of Kundalini. These English books were later on published and were accepted as authentic in the Western market. I’ve seen a book, so big, written by a German, so big, where he says that the Kundalini is in the stomach! Also they have coined lots of words, which have no relevance whatsoever. Like the words like ‘Shaktipat’. There is no word like that ‘Shaktipat’ anywhere in the Vedas, if you see, or in any one of the Puranas or in any Kundalini text. There are so many such books that are in the market that I find it difficult to explain to people that they have no relevance whatsoever to reality. By reading these books, we can be misled in the modern times. It was all perhaps done with the idea of creating a market, a money-making proposition. This Kundalini resides in the sacrum bone and she is the power of pure desire within us. All other desires are not pure, because even when we get our desire fulfilled, we are not fully satisfied. The principle of economics is that desires in general cannot be satisfied. They’re not satiable, in general. One desire is satisfied, then you want to have another, then you want to have another. So this is the only desire, which is dormant within us; the desire to be united with the Divine is the pure desire. When the person realises that, “I’ve been running after some sort of a mirage for joy.” then he comes up as a special personality, called a seeker. Now, the seeker is described as a Sadaka, but only a hundred years back William Blake in England described them as ‘men of God’; “The men of God will become prophets and they will have powers to make others prophets.” But for all practical purposes they cancelled him as a crazy man. So once we cancel all of them as crazy what do we become? Now the time as come to prove that you are the Spirit and whatever they have said is the truth. (Translator misses part of it) You are not translating it fully. (Laughing) I understand a thought because if you can know something before the thought, you can understand. Alright, now, the rising of the Kundalini, awakening of the Kundalini is a natural process. Like a candle is enlightened and that candle can enlighten another candle. How can any candle be obliged to the other? The other candle was just ready and this candle was enlightened; it has enlightened another candle, that’s all. I would say, the seekers are the ready candles and someone like me can just enlighten them. And once you are enlightened, you can enlighten others also. In India we had one farmer who got realisation and he has given realisation to forty thousand people so far. To begin with it was ten thousand and now I find it’s about forty thousand. Out of them, not all of them have come up, but most of them are very much there. So this Kundalini passes through all these centres, vitalising, nourishing them one by one. And when it nourishes them, they get back to their normal condition, and later on to their higher condition. These subtle centres on one side look after the plexuses that we have on the physical areas, and also the ductless glands, and on the other side it looks after the emotional side. So the evolution takes place in such a manner as a spacecraft goes into space. In a spacecraft you must know that the containers are placed within each other. (Translator doesn’t understand.) In a space craft the containers are contained in each other, like one into another, telescopically. Now the first container goes to a certain point; an explosion takes place; another goes with a much greater speed, then another again is exploded and then the velocity increases, then again an explosion takes place. Like that it goes on till in the end the body of the spacecraft is thrown into space. That’s how we had first our physical, then our mental, emotional and spiritual evolution. And now it is the time for us to get into the space where all these four dimensions get integrated, and we become one with our Spirit which represents the peace, the bliss within us. But as a result of that we become, again I say we become, on our central nervous system, collectively conscious. It’s a consciousness, a new dimension in our awareness where we can feel on our fingertips the chakras, the centres of others and our own centres. Now if you just know the knowledge about how to cure the centres, you are all right. You can treat others also in the same manner with the power of this compassion which is silent; which is silent and which acts. Without any payment, without any idea of getting anything out of you; in Sanskrit it is called as Nirvaj. Nirvaj; without any interest. So this is the energy that is all pervading. In the Patanjal Shastra it is called Ritambara Pragnya. (Translator hesitates over word) You know that. He knows that, Ritambara Pragnya. That is very close to Sanskrit. This power, this all-pervading power is the power of compassion and love of God, which does all the living work, like these flowers becoming the fruits. What do we do? We can’t even create a stone of our own. This power is a subtle power, which you start feeling after your realisation. If you know how to manipulate this power, you are there, and this is what one should know as truth. That you should feel this all pervading power, this subtle power, on your finger tips. Now maybe when I talk of God in these modern times, people don’t like it. But you accept this as scientists with an open mind, as a hypothesis. If it is proved then you have to be honest. You must have courage to be honest these days. That is very important. And you must have humility to fight your ego, which is a big barrier. On one side we have the problem of conditioning, and you require courage to fight it. On the other side is the ego, which can be a big barrier; we must have honesty to fight it. So you are born at a time which is the most precious time and the opportune time. You have been seekers in your previous lives and you are special people. Now if you have the courage and the honesty, no problem. In this short time of two days, I do not think I can cover this big subject. But it is much easier to give you realisation. It takes hardly any time. It’s like in this room if you have to put on the lights, you say all right, press the button and you get it. But to explain about the history of electricity then the organisation of electricity, will be a headache and days together I’ll have to speak. It’s not necessary also to know. You just press the button and you get it! It’s all built in! And once the light has come into you, you yourself will start seeing it; I won’t have to tell you anything. You’ll become your own master. Then it’s much easier to talk about anything. Because if you tell anything to human beings they will do just the opposite. It is better that they see for themselves and correct themselves. It’s much more helpful and quicker. So we will have the experience now, but if you have any questions, I would like to answer them. Only thing, please don’t ask controversial questions or aggressive questions. You cannot give me anything; I do not want anything from you. I have come here to give you whatever you have – your own. It is your own, for which you don’t have to pay anything or do anything. So I would request you not to be unnecessarily aggressive with me. Now please ask me a few questions and then we’ll have the experience. Question: He has read in a book that the Kundalini can burn the central nervous system. Shri Mataji: That’s what I told you already. Some people, I don’t know from where, must be from the lunatic asylum, wrote such a nonsense. I mean, it doesn’t burn! I haven’t seen it burning anyone. It must be some people who are unauthorised. Supposing you put your fingers into that or something, (pointing to the electric socket) I don’t know what they did. I mean it’s something very naïve, they must have done something and they must be funny people. I don’t know. I can’t understand. Question: When you eat meat, does it stop the Kundalini? Shri Mataji: No, no, no. Not at all. This is another… This has nothing to do with it, what you eat. Actually, I know there should be balance within us. We shouldn’t eat too much meat or too many carbohydrates, too much of this. But I don’t know from where this idea has come, even Buddha ate the meat of a wild boar and got sick and died. We have a community in India which is very much abroad, because they are very money-minded people; they believe that we must save mosquitoes, bugs and all parasites; better than human beings. Kundalini is a subtle thing. Shri Mataji: No, sometimes, you know, some seekers who have been seeking and seeking and seeking are fed up of life and their Kundalini rises and they meet their Spirit then, of course, out of joy their eyes are filled with tears. There’s no harm in that. We are not machines, are we? That we should not have any tears in our eyes sometimes, to express our joy. When we are very joyous also there could be tears in our eyes. But you don’t get involved into it, you become a witness. You see it, you see yourself. You become a witness of the whole drama. You see yourself feeling that joy. Question: The word extreme was mentioned in the discussion before a lot of times, but we have gone to extremes. Which is the power in our body, which brings us to that point? Translator: He asked; the word extreme was used quite a lot, but what is it that drives us to extremes? Shri Mataji: Extremes are all kinds, you see. Now some people must have read a few words say about physical yoga; they end up with heart attacks! Now a person who is very temperate, moderate in life, is balanced! The prophets tried to give balance to us. Like when people became too much attached to the deities and the rituals, they came to teach us; “No, there is nothing like that. You’d better take to your Self.” Like Buddha did. Buddha said that “Better not talk about God at all, because if you talk about God everybody thinks they are God.” So he just talked about self-realisation, that’s all. First you have your first connection. It’s like this; we swing from the left to the right. Means we become too attached to something, blind-folded; then we discard it. Then we go to the right, we start rationalising everything. Like in Christianity, for example, on one side is Catholicism; another extreme blind faith in someone, who is not a realised soul perhaps, maybe. And the Protestants are another extreme, they are still protesting. They have rationalised everything, even Christ, everyone divine, everything rationalised, scientifically proved! You cannot rationalise Christ. Now they are saying he was not divine, he was a human being. How do they know? They are not even realised souls. What are they talking about? Now this is going to another extreme. Like this in every walk of our life we go to extremes. Some people are alcoholics and others are work alcoholics (laughing). Both are just the same. 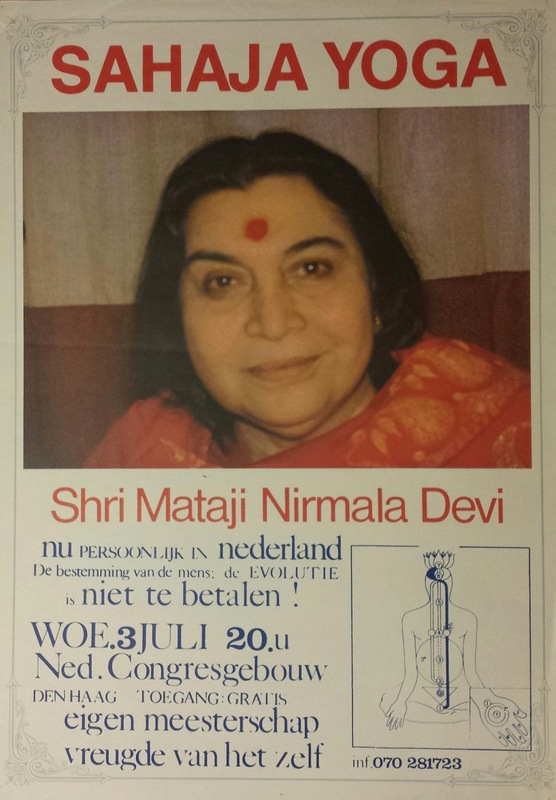 Shri Mataji: He is giving a lecture. What is it? Translator: Can you make your question short please? Sri Mataji: Did you follow anything out of it? Translator: He was telling about some cases of people who are very clairvoyant or paranormal, and they got possessed. Sri Mataji: Alright. About that I will tell you tomorrow; everything – clairvoyance, ESP, all right? I’ll tell you all that tomorrow. Tomorrow I’ll come earlier. Alright. Anything else? I think you’d better have your realisation first. Questions will not give you realisation. Better take your realisation if possible. Let’s start. I can’t guarantee it though. Question: Can I ask a question? Man: Why would a self-realised soul eat meat? Sri Mataji: Eat meat? Is that such an important thing? What’s the use of saving the… Why are you worried about the chickens? (Laughing) I can’t give realisation to chickens, alright? Our attention is more on animals than on human beings. That’s the trouble you see. I don’t want you to put your attention to animals please. Put attention on human beings, who are the epitome. One human being has come out of thousands and thousands of chickens. Moreover, I cannot prove it, but it is a fact that when you eat the chicken, the chicken gets its evolution. Otherwise how does the muscle of the chicken improve? But I don’t say you’ll eat it, I am not saying you eat. I think the western people should not eat so much, I agree, but we should not try to put our attention onto something that is not important. Buddha did it because there is no sense in saving the wild boars, is there? On the contrary I have seen, the vegetarians, some of the vegetarians… I know of a guru in America who converted people to vegetarianism and Sikhism, and these are the people who carried guns to India, to create all the problems for us, do you know that? Yes he said so. Yes it is true. I mean it’s a fact. Yes and the murder of Sanjeeva Gandhi was arranged by them! (Inaudible question) No because they thought that by becoming vegetarian now they can kill anybody else, human beings. If they cannot kill the animals, they are killing human beings. I don’t know how it is explained psychologically, but I have not known people who are vegetarian to be extremely kind people, I have not known. That’s how we want to discard everyone; because Nanaka ate meat, Kabhira ate, Mohammad Saab ate, Christ ate. Don’t divert your attention. You have to talk of something higher. It’s not important. Ah, he can’t help it! Question: What is the relationship between astrology and the Kundalini? Shri Mataji: Very much! But I’ll tell you later, it’s quite complicated, all right? It is, very much. Astrology, all the cosmology, everything is within us! It has, no doubt. But you go beyond astrology. You go beyond cosmology. You go beyond all your gunas. You go beyond everything, time and space when you become the Spirit because it is not attached to anything. By studying astrology you cannot become self-realised. But in India, say any child is born, the first thing they will tell you, the most important thing, whether that person will have a ‘sat guru”, a good guru, or will that person get realisation – in India, Indian astrology. And we have a special type of astrology in India by which you can make out an incarnation, because the whole attention is towards God. And the most important thing is to get self-realisation. All right, now should we have… yes madam? Question: Can you tell me about karma? Question: What you can do about them. Sri Mataji: All right. The karmas are within us, are expressed in our two.., this I am going to tell tomorrow. But today if you want to know, there are two institutions within us, which are built through our karmas. One is through our conditionings and through our ego. Through our ego, the one which is built is called as ego, but we call it ‘ahamkara’. And through our conditionings whatever is built is called as superego by you, we call it ‘manasa’. Both things get sucked in when the Kundalini passes through the Agnya. And you go beyond it. That’s the magic. Sri Mataji: Yes of course. Now don’t think of your past. Forget the past. One thing is important, forget the past. It is finished. And the future doesn’t exist. So now one thing you have to know, you are seekers, you are at the epitome of all the creation. And please do not feel guilty for anything. You have to tell yourself clearly that I am not guilty at all. Maybe here because you have the World High Court you might be feeling even more guilty, I don’t know. (Translator doesn’t understand) The World High Court is here, then they might be feeling more guilty. Please don’t feel guilty. You should not feel guilty at all. Now, it is a very simple method, by which you yourself can raise your own Kundalini. You’ll have to touch the different centres on the left hand side with your right hand. And the left hand you will place towards me. Those who do not want to be the Spirit should leave the hall. And please you have to join in. All of you have to keep your eyes closed; and not to open your eyes at all, because the attention should be inside. It hardly takes five to ten minutes. Now bring it down and see for yourself, in the hands now. Don’t doubt, don’t doubt yourself; both the feet on the ground. To give it a balance put your left hand towards me and the right hand towards the Mother Earth. Now, put the right towards me and left hand like this. I will tell you why we did it tomorrow; like this backwards, the backside. Now see in both the hands. Some people do not feel it in the head or in the hands. You have to say; Mother, that’s for the Kundalini, please come in my head, seven times. Or come in my hands, seven times. Ask your Mother Kundalini. Keep your eyes open and watch me without thinking. All those who have felt the cool breeze on the head or in their hands please raise both your hands. So many of you! Those who have not felt will feel tomorrow and those who have felt today, will establish it tomorrow.